This photo was taken just after I bought the car. It doesn't look real bad in the photo, but it was in need of a total restoration. 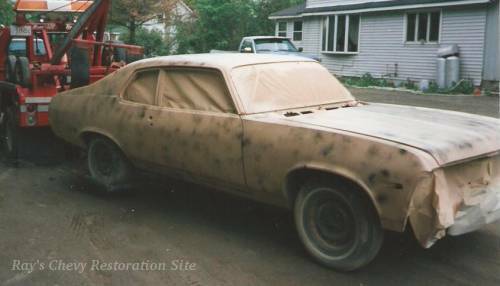 About the only bad spots that show up in this photo are the rough looking bondo job around the rear wheel openings and the dull red paint job. There's also the non-original bucket seats that practically touch the roof. The sub frame and other structural elements of the body were solid and only had minor surface rust. 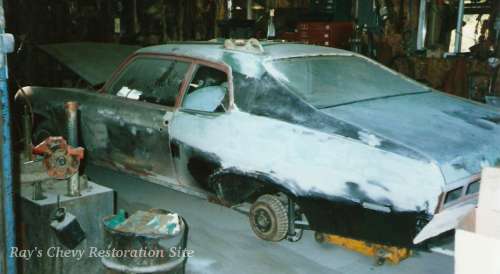 However, the rest of the body work and paint were very rough. 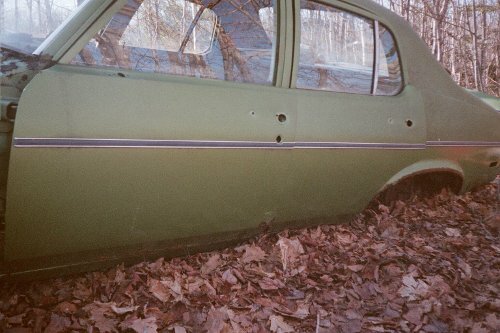 The original color of the car was Cream Beige (GM #50). 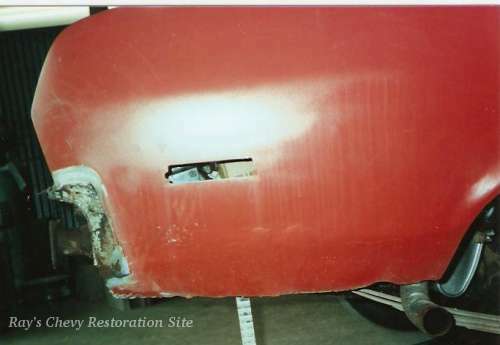 A former owner had done some crude body work around the rear wheel openings and on the lower front fenders. Rust holes had been covered with pop-riveted aluminum flashing and bondo. On top of that was a cheap (and very rough) red paint job that soon began to fade to a nasty pink color. The interior was also in very poor condition. The front bench seat had been replaced by a set of high back bucket seats out of some other type of vehicle. They were propped up on a stack of 2x4's and held to the floor with long pieces of threaded rod. Old pieces of shag carpet were covering the floor and rear window package tray area. Most of the material had been ripped off of the headliner, leaving the backing board exposed. The dash pad was cracked, the lower dash had been spray painted, and the radio hole had been hacked up. The door panels had some minor rips and gouges along with some speaker holes cut in them. The rest of the interior panels were sun faded, but usable until I could find some better ones. 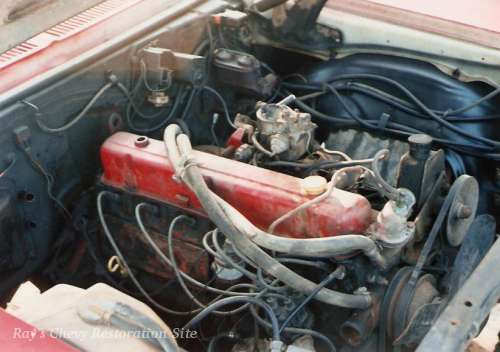 The car still had its original inline 6 (250 cu. in.) engine and column shifted three speed transmission. The engine had a cracked block because the former owner didn't use antifreeze one winter. The radiator and heater core were also damaged. 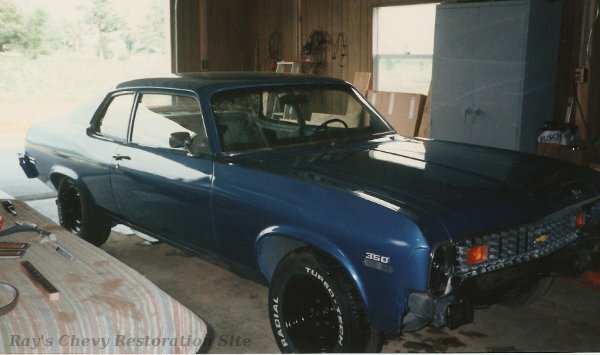 I used this 4-door '74 Nova as a parts car for the restoration. I never did take any pictures of it before tearing it apart but it was a complete driveable car with only 25,000 miles. Despite the low mileage, it had some serious underbody rust issues caused by road salt. The rear leaf spring shackles were poking up through what was left of the trunk floor! Here's the freshly painted 350. 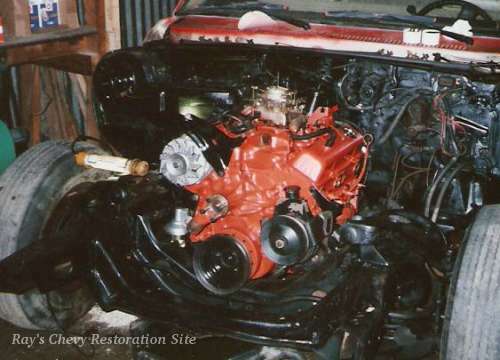 This being my first engine paint job, I wasn't all that careful masking off (or removing) items such as the temperature sending unit and valve cover grommets. I have since gone back and re-detailed the engine to fix some of those little mistakes I made back then. I think the power steering pump was just on there temporarily when the second picture was taken since it doesn't appear to have been re-painted yet. 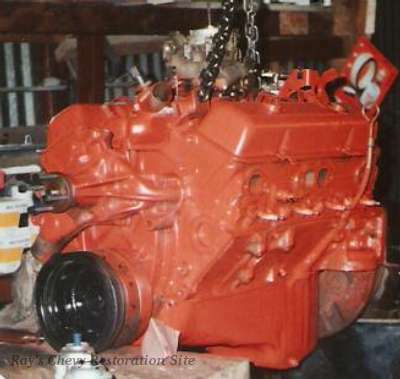 The swap from the L6 to the V8 also required several other items from the V8 parts car. Here are the details of the swap. 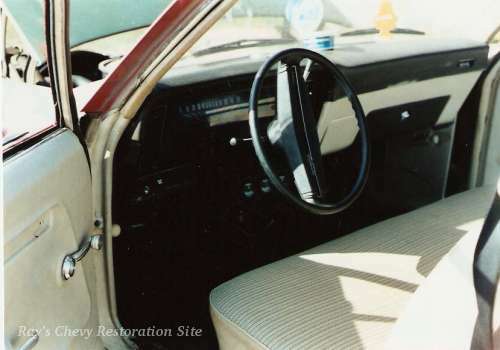 This photo shows the interior after a quick "fix-up" using some parts from the 4-door parts car. The 4-door bench seat didn't fold ahead for access to the rear seat but it was still better than those bucket seats the former owner had mounted on top of 2x4's. Here is the driver side fender that was taken from the green 4-door parts car. After sanding the bottom edge, I found a small amount of rust (much less than the original fender). 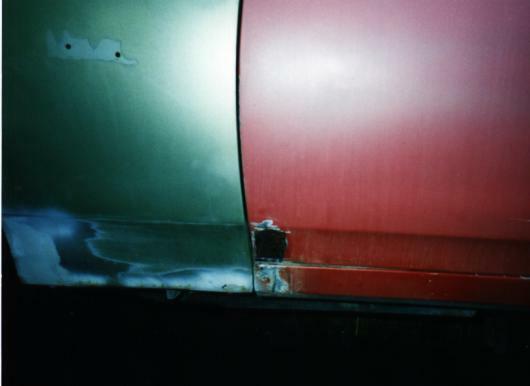 This photo also shows the rust that was cut out of the lower corner of the door. I continued on with the body work by cutting out the old quarter panels that were full of aluminum flashing patch panels and loads of bondo. While the quarter panels were off, I installed new outer wheel housings. 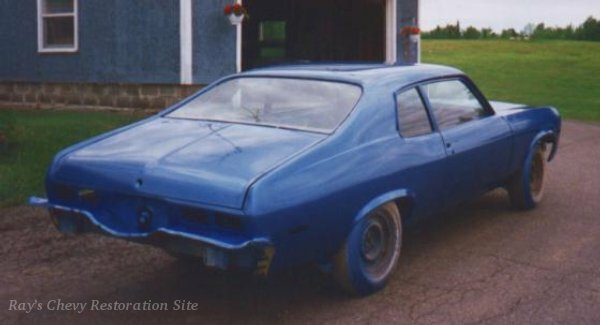 Back at this time, I didn't have the equipment or experience to tackle major bodywork such as installing the new quarter panel skins and painting the car so I took the car to a local body shop. At the shop, the new quarter panel skins were welded in place and smoothed out with a skim coating of body filler. 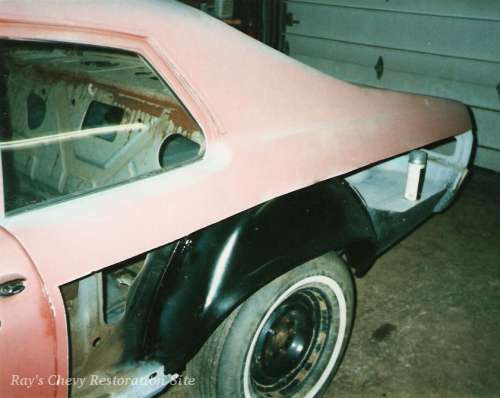 The body shop also sanded off the remaining old red paint and welded pieces of new sheetmetal into the lower front fender and door corners where I had cut out the rusty sections. Here it is at the body shop with some fresh primer and a dusting of black paint to be used as a "guide coat" for block sanding. Back from the body shop with a new paint job. 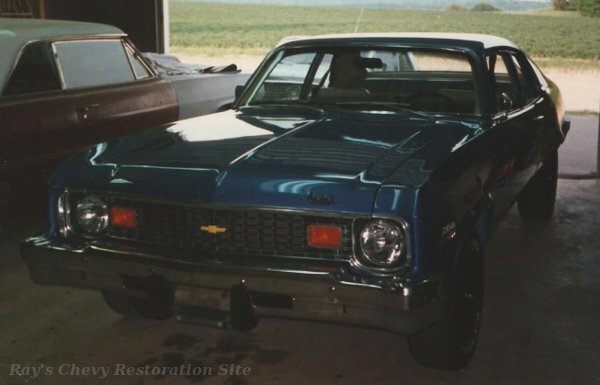 The paint is Dupont ChromaBase/Clear in GM# 26 Bright Blue Metallic. Prior to taking the car to the body shop, I had removed all of the trim, emblems, bumpers, and interior. I re-installed all of those parts along with new weatherstripping. By July 1995, the bulk of the restoration work was complete. © 1998 - 2019 Raymond McAvoy. All Rights Reserved.